Hello! You probably found me from Paris’ blog during the Imbolc TarotBlogHop. This is quite exciting! We Tarot bloggers are coming together to share with we each other our “lights” with others. I realized that I needed to create a spread to help me answer this. It would help me to find clarity in how to answer this for myself. So I got out my Druid Craft Tarot deck, shuffled and drew 5 cards. Card 1- Knight of Pentacles-Be careful when getting things out into the world. Take steady steps as you move forward. You don’t need to rush ahead willy-nilly. You have much to do. Make your plans count. For me this means read as many book and resources as I can. Speak when I actually know what I am talking about and stand by what I say. No one is perfect, but I need to be willing to be wrong. I am not infallible. I can bring new ideas to things. I just need to make sure that I am coming from a place of information not ego. I get joy from learning new things and can share the resources and lessons I find with others. Card 2- The Lovers– Communicate, communicate, communicate!. One can’t get ahead without others in our world. This reminds me I have many friends. I have a partner who is a great listener and who encourages me to grow. I can pull from my past to grow my future. I studied with James Wanless, have attended many PantheaCons and have been to Reader’s Studio numerous time. I learn something new each time I take a class and expand my knowledge base. I share these concepts and ideas with everyone I meet and with whom I discuss Tarot. It is great to be able to converse with others who are just as passionate about Tarot as I am. Card 3- 10 of Wands– Carry on with what you are working on for yourself. You are almost there. I take this to mean I need to work on doing more of my own work. I need to separate my daily job, which I do well, and recall that I have a Tarot Blog of my own as well as a business I wish to grow for myself. Of course the small problem here is that I am doing a daily job I love and believe in. I just need to keep building my own business as well. 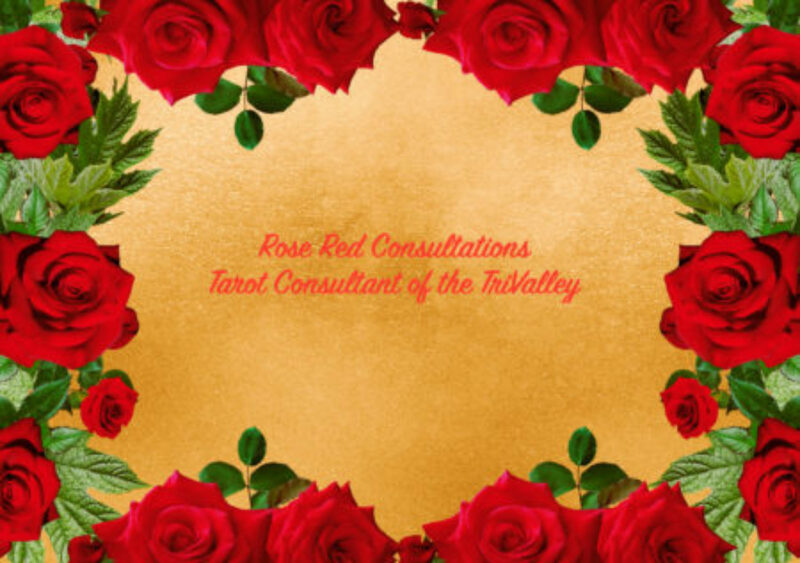 I need to set up time for myself to write more and get out there as Rose Red Tarot, not just as Rose who works for an awesome company. I am building this business even if it is in slow pieces. I need to not give up. Card 4- Ace of Swords-Put your influence out into the world. Do more self work. Study more. What I need to remember for myself is I need to participate in more conversations about Tarot. I need to get involved in my community more. I need to work my plan more thoroughly. It is time to take the next step from just having a web presence. I need to do more work with others. Create more with my Tarot Family. Express my thoughts in more forums. Share my ideas with others. I already do some but I need to do more in order to really make my light shine. Card 5- The World– Too many distractions will pull attention away from your focus. Work to keep your focus clear and move forward. I do many different things: I volunteer for Science Fiction conventions, facilitate at two different Tarot MeetUps, work two jobs, and have a presence on the web. I must make plans in advance. I must schedule my time so I can get all the things done I wish to achieve. Of course I also need to sleep and there are only so many hours in a day. I need to remember to make my personal Tarot business a priority. It is just as important as the other things I do. It will help me to grow my Tarot Business and improve my life. I think that by working with my Tarot Family, setting more of my Tarot plan in motion and treating my Tarot business as a priority, I can be a better candle in the world and shine a stronger light. Of course this is just one way to create a better candle in the world. For more check out Stephanie Francis’ blog here. Tarot and the world around you.. well me actually. I carry at least one Tarot deck in my purse or bag everywhere I go. I see the cards acted out in the small things like the 3 young girls dancing each one different heights which reminds me of the 3 of Cup from the Robin Wood deck or seeing the young hippie wondering around downtown with a small pack and his dog ala The Fool. I recall the cover of the Led Zeppelin IV Inside Album with the Hermit on it. And of course the comic about the Tarot the Witch comic. I am finding more and more that Tarot is where I live. I go to Tarot events to see the new decks. I follow Tarot people who I find fascinating. I am amazing when and where Tarot shows up in my world.